It does seem like a strange part of the word, unless you look back to where we get it. According to Wiktionary, Software was first coined as a term in 1953, and was named based upon the fact that the term for the physical elements of the computer were already known as hardware. A quick peek into the online Merriam-Webster dictionary gives us a few definitions for the root of that word, ware. The ones we’re concerned with are the first and the last definitions in the first entry: “manufactured articles, products of art or craft,” and “an intangible item (such as a service or ability) that is a marketable commodity.” We can combine these to give us a fair representation of what soft-’ware’ means: “manufactured articles to provide a service that is marketable.” After all, what is a computer program, if not an assortment of code meant to complete a specific task desired by a specific audience? The word was first coined by Paul Niquette in 1953. Dreamware - This software type covers those that have not yet begun development and are still in the “what if there was a software that…” phase. Many of these projects never begin development, remaining something that some software developer once dreamt up. Trialware - This variety of software is that which is only available to the user for a limited period of time, after which it is only available in a restricted form (if at all). This can be considered the free sample of software, offering just enough to make you want more. Crapware - You know how a new computer often comes pre-installed with programs that you have no interest in, let alone the need for? This is what is known as crapware, as it takes up space without really offering anything to you. 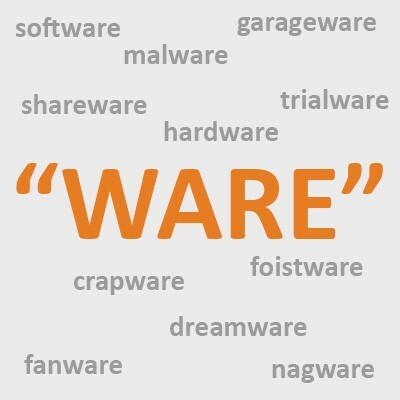 Another four-letter synonym for ‘crap’ can also be combined with “-ware” to make another, more forceful term for this variety. Foistware - Malware can often come bundled with other, more legitimate software titles, to be installed without the user knowing. Of course, other programs can do this as well. Foistware is the term given to these software stowaways. Fanware - Professionals aren’t the only ones capable of writing code, and even professionals will continue their coding in their off hours. Fanware describes the products that special-interest coders write to promote that interest. Nagware - Another version of trialware, nagware describes a software title that will interrupt a user with persistent reminders to register it. Nagware will often disable the use of the program for short intervals during use, or display pop-up dialog boxes. In essence, this kind of trialware is designed to coerce a user into purchasing the full version through annoyance. Garageware - This is a not-so-nice term for software that simply doesn’t perform as it should or has a lot of mistakes. The name is meant to suggest that the creators were total amateurs, developing this program literally in their garage. Again, this is just a short list of the many different software varieties out there. What other ones have you heard of? Share them in the comments!